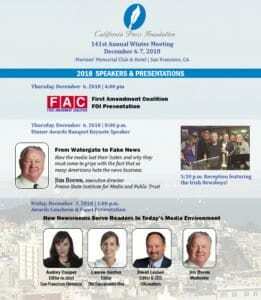 You are cordially invited to join the California Press Foundation for its 141st Annual Winter Meeting, to be held Dec. 6-7 at the Marines’ Memorial Club & Hotel in San Francisco. At 5:30 is a no-host reception and music by the Irish Newsboys. The Awards Banquet Dinner at 6:30 will feature the presentation of the Justus F. Craemer Newspaper Executive of the Year award to Erik Cushman, publisher of Monterey County Weekly; the First Amendment Coalition Free Speech and Open Government Award; and the Jack Bates Award. Friday, Dec. 7 includes the Past Presidents Meeting at 9 a.m. and the Cal Press Board of Directors meeting at 10. A no-host reception is at 11:30, followed by the Awards Luncheon at Noon. It features the presentation of the Philip N. McCombs Achievement Award; Mark Twain Award for Journalism Excellence; and the induction to the California Newspaper Hall of Fame. The Thursday afternoon FAC presentation is free, but seating is limited and registration is required.